The former UN Chief Kofi Atta Annan has passed away at the age of 80. Annan served as a Ghanaian diplomat and the seventh Secretary-General of the United Nations from January 1 1997 until January 1 2007. The UN secretary-general who won the Nobel Peace Prize in 2001 for his humanitarian work. Annan once said, "that suffering anywhere concerns people everywhere." Annan was an influential figure who played a role in helping solve crises such as the HIV/Aids pandemic, the Iraq War, and climate change. 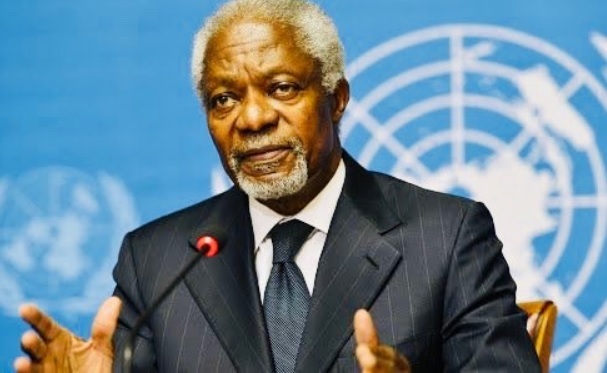 Annan became the first African to lead the United Nations and became one of the most recognized diplomats in the world. The former leader was born in the city of Kumasi in what was then known as the Gold Coast in April 1938. He was born into a wealthy family and was the grandson of traditional leaders. His father would go on to become a provincial governor. In an interview in 2012, Annan said, "I walked away as a young man convinced that change is possible, even radical revolutionary change." Annan would go on to become the world's top diplomat and served two terms from 1997 to 2006. He also became the UN's special envoy for Syria and led efforts to find a peaceful resolution to the country's situation. James, nobody cares whether Kofi Annan is alive or dead, and nobody cares about you what he did during his lifetime. What we care about is how you typed 'Annan once said, "that suffering anywhere concerns people everywhere".' when you meant to type ' Annan once said that "suffering anywhere concerns people everywhere." '. You're not paying attention. Snap out of it. One evil fucker less, six gorillion to go.